The Elite Supreme SUV Cover provides all season indoor and outdoor protection for your vehicle. This nearly impenetrable 4 layer fabric is fleece lined to protect fine automotive finishes. Its high water resistance makes it virtually waterproof, yet breathable. The Elite Supreme is great for rain and snow protection. The fabric naturally resists rot and mildew. Its seams are ultrasonically welded to ensure the cover doesn't leak. The material is also UV treated for sun and heat protection. An elastic front and rear hem ensures a snug fit. The Elite Supreme SUV Cover comes with a FREE cable lock, storage pouch and antenna patch. 3 year warranty! Suggested Retail Price: $150.00 to $175.00 and up. ES-U0 - Four Layer Cover fits SUV's up to 13'5"
The Elite Supreme SUV Cover fits vehicles like the Jeep Wrangler, Rav 4, etc. It provides all season indoor and outdoor protection for your vehicle. This nearly impenetrable 4 layer fabric is fleece lined to protect fine automotive finishes. Its high water resistance makes it virtually waterproof, yet breathable. The Elite Supreme is great for rain and snow protection. The fabric naturally resists rot and mildew. Its seams are ultrasonically welded to ensure the cover doesn't leak. The material is also UV treated for sun and heat protection. An elastic front and rear hem ensures a snug fit. The Elite Supreme SUV Cover comes with a FREE cable lock, storage pouch and antenna patch. INCREDIBLE 3 YEAR WARRANTY! Suggested Retail Price: $150.00 to $175.00 and up. The Elite Supreme SUV Cover fits vehicles like the Lexus RX300, BMW X3, etc. It provides all season indoor and outdoor protection for your vehicle. This nearly impenetrable 4 layer fabric is fleece lined to protect fine automotive finishes. Its high water resistance makes it virtually waterproof, yet breathable. The Elite Supreme is great for rain and snow protection. The fabric naturally resists rot and mildew. Its seams are ultrasonically welded to ensure the cover doesn't leak. The material is also UV treated for sun and heat protection. An elastic front and rear hem ensures a snug fit. The Elite Supreme SUV Cover comes with a FREE cable lock, storage pouch and antenna patch. INCREDIBLE 3 YEAR WARRANTY! Suggested Retail Price: $150.00 to $175.00 and up. The Elite Supreme SUV Cover fits vehicles like the Ford Explorer, Acura MDX, etc. It provides all season indoor and outdoor protection for your vehicle. This nearly impenetrable 4 layer fabric is fleece lined to protect fine automotive finishes. Its high water resistance makes it virtually waterproof, yet breathable. The Elite Supreme is great for rain and snow protection. The fabric naturally resists rot and mildew. Its seams are ultrasonically welded to ensure the cover doesn't leak. The material is also UV treated for sun and heat protection. An elastic front and rear hem ensures a snug fit. 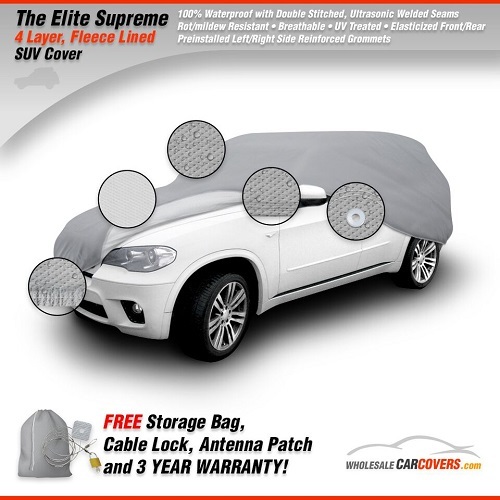 The Elite Supreme SUV Cover comes with a FREE cable lock, storage pouch and antenna patch. INCREDIBLE 3 YEAR WARRANTY! Suggested Retail Price: $150.00 to $175.00 and up. The Elite Supreme SUV Cover fits vehicles like the Mercedes Benz GL, Yukon, etc. It provides all season indoor and outdoor protection for your vehicle. This nearly impenetrable 4 layer fabric is fleece lined to protect fine automotive finishes. Its high water resistance makes it virtually waterproof, yet breathable. The Elite Supreme is great for rain and snow protection. The fabric naturally resists rot and mildew. Its seams are ultrasonically welded to ensure the cover doesn't leak. The material is also UV treated for sun and heat protection. An elastic front and rear hem ensures a snug fit. The Elite Supreme SUV Cover comes with a FREE cable lock, storage pouch and antenna patch. INCREDIBLE 3 YEAR WARRANTY! Suggested Retail Price: $150.00 to $175.00 and up. The Elite Supreme SUV Cover fits vehicles like the Ford Expedition, Lincoln Navigator, etc. It provides all season indoor and outdoor protection for your vehicle. This nearly impenetrable 4 layer fabric is fleece lined to protect fine automotive finishes. Its high water resistance makes it virtually waterproof, yet breathable. The Elite Supreme is great for rain and snow protection. The fabric naturally resists rot and mildew. Its seams are ultrasonically welded to ensure the cover doesn't leak. The material is also UV treated for sun and heat protection. An elastic front and rear hem ensures a snug fit. The Elite Supreme SUV Cover comes with a FREE cable lock, storage pouch and antenna patch. INCREDIBLE 3 YEAR WARRANTY! Suggested Retail Price: $150.00 to $175.00 and up. The Elite Supreme SUV Cover fits vehicles like the Chevy Suburban, etc. It provides all season indoor and outdoor protection for your vehicle. This nearly impenetrable 4 layer fabric is fleece lined to protect fine automotive finishes. Its high water resistance makes it virtually waterproof, yet breathable. The Elite Supreme is great for rain and snow protection. The fabric naturally resists rot and mildew. Its seams are ultrasonically welded to ensure the cover doesn't leak. The material is also UV treated for sun and heat protection. An elastic front and rear hem ensures a snug fit. The Elite Supreme SUV Cover comes with a FREE cable lock, storage pouch and antenna patch. INCREDIBLE 3 YEAR WARRANTY! Suggested Retail Price: $150.00 to $175.00 and up. The Elite Supreme SUV Cover fits vehicles like the Ford Excursion, etc. It provides all season indoor and outdoor protection for your vehicle. This nearly impenetrable 4 layer fabric is fleece lined to protect fine automotive finishes. Its high water resistance makes it virtually waterproof, yet breathable. The Elite Supreme is great for rain and snow protection. The fabric naturally resists rot and mildew. Its seams are ultrasonically welded to ensure the cover doesn't leak. The material is also UV treated for sun and heat protection. An elastic front and rear hem ensures a snug fit. The Elite Supreme SUV Cover comes with a FREE cable lock, storage pouch and antenna patch. INCREDIBLE 3 YEAR WARRANTY! Suggested Retail Price: $150.00 to $175.00 and up. The Elite Supreme SUV Cover fits vehicles like the Extended Yukon XL, Cadillac Escalade, etc. It provides all season indoor and outdoor protection for your vehicle. This nearly impenetrable 4 layer fabric is fleece lined to protect fine automotive finishes. Its high water resistance makes it virtually waterproof, yet breathable. The Elite Supreme is great for rain and snow protection. The fabric naturally resists rot and mildew. Its seams are ultrasonically welded to ensure the cover doesn't leak. The material is also UV treated for sun and heat protection. An elastic front and rear hem ensures a snug fit. The Elite Supreme SUV Cover comes with a FREE cable lock, storage pouch and antenna patch. INCREDIBLE 3 YEAR WARRANTY! Suggested Retail Price: $175.00 and up.